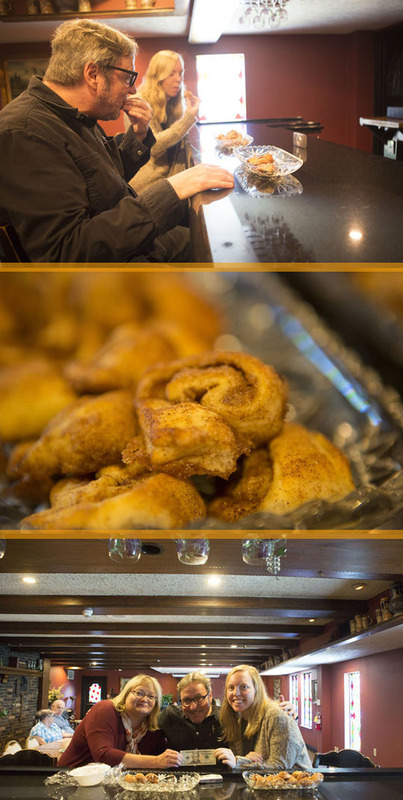 Three words can bring an instant smile to a lot of Peorians and those three words are: “Jumer’s Cinnamon Rolls.” If you’re too young to remember them, you’ve probably heard an old-timer like myself remembering how delicious those warm, sugary, cinnamon rolls were. The cinnamon rolls were eaten at the dining room at Jumer’s Castle Lodge here in Peoria. Jumer’s closed in 2009 but was brought back to life when it re-opened as Courtyard Estates in 2011. Courtyard Estates is a senior living community and it still maintains a lot of the classic Jumer’s atmosphere within it. The public dining room is closed, but a magical thing started happening two years ago inspired by this nostalgic column by Phil Luciano in the PJ Star—they brought back the cinnamon rolls for the holiday season! Sherry Arrowsmith who’s the Marketing and Admissions Director decided to have an annual pre-holiday sale of the Jumer’s cinnamon rolls and the profits go to St. Jude, so it’s a sweet way to donate to a great cause. The cinnamon rolls go back on sale this year and if you scroll down this post you’ll find out when you can place your order! 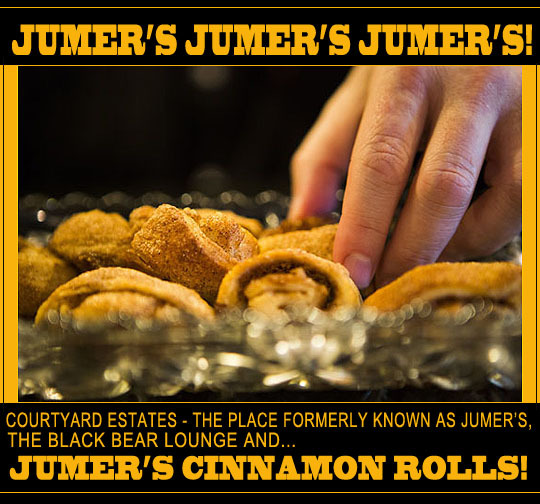 Let’s go to Courtyard Estates and take a look at the building that used to be Jumer’s Castle Lodge and find out when you can place your order for those wonderful Jumer’s cinnamon rolls! Here we are at the site of what used to be Jumer’s Castle Lodge and it’s now Courtyard Estates, a senior living complex. As you can see from these shots, they maintained the castle look of the building and it’s one of Peoria’s most unique and iconic structures. 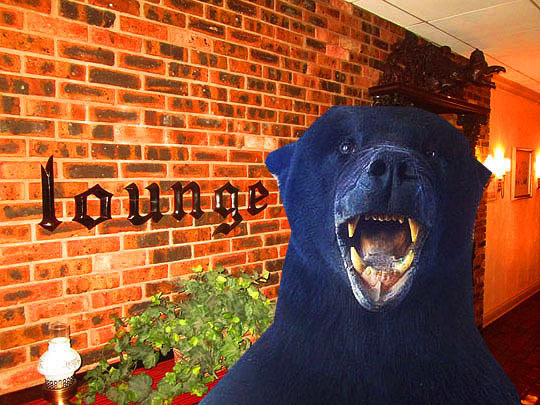 The Black Bear Lounge! I love that they’ve kept this place just the way it was back in the Jumer’s days. It was named after the Black Bear that used to greet people here when it was Jumer’s. 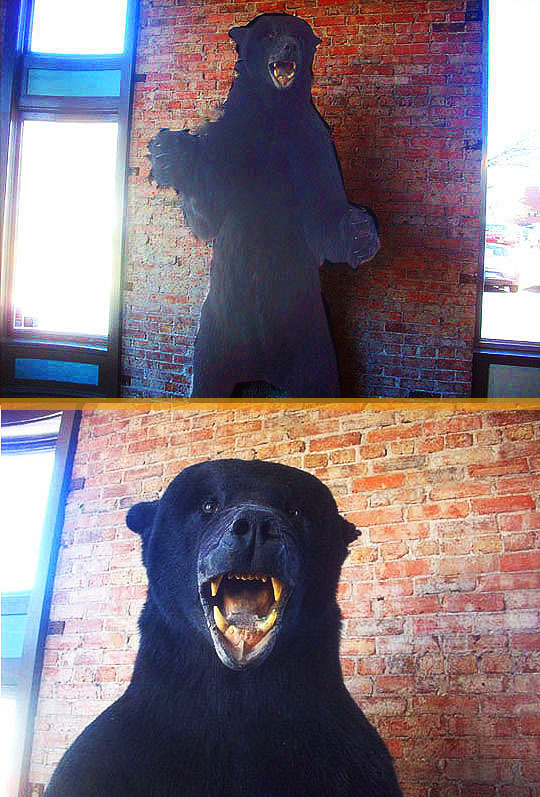 The bear is no longer here, but it’s still standing in downtown Peoria. There we go, now it really feels like the old days! Before we go in, meet Mark Jones! Mark’s a professional photographer and he volunteered to take some photos of our afternoon in the Black Bear Lounge. Mark specializes in portraiture and commercial photography. He’s booking sessions now, so if you need corporate photos, portraits, head shots, wedding or maternity/newborn packages you can call him at 309-472-2923. You can see more information at his facecrack page right here. Okay, let’s start this afternoon in the Black Bear Lounge and a special treat is coming up! The Black Bear Lounge With Photos By Mark Jones! 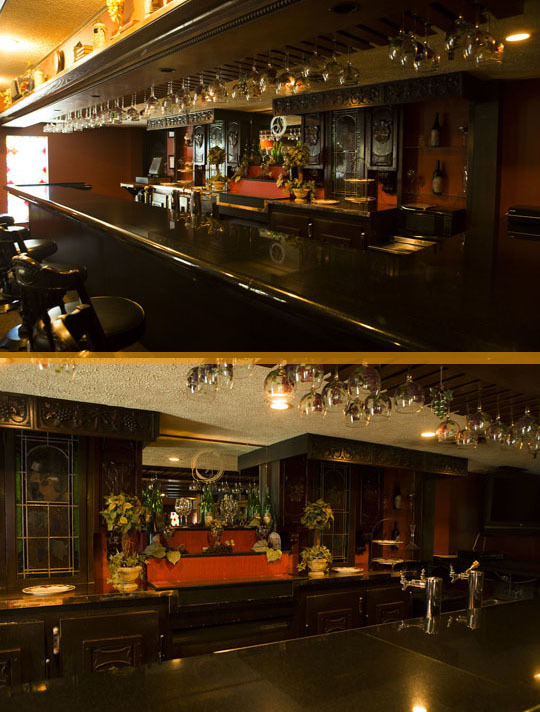 Here’s the bar in the lounge and it looks just the same as it did when the bar was in operation. Sadly, there’s no beer for sale in here anymore, but there’s still some lively bingo games that happen in here! And now the special event is happening! I was joined by Sherry on the left, who’s the Marketing and Admissions Director and that’s Olivia on the right who’s the Marketing and Admissions Assistant. And the most welcome guest are two bowls of warm Jumer’s cinnamon rolls that Sherry baked for this occasion! These are the first batch for the upcoming holiday season! I hadn’t eaten these in well over a decade and it was like biting into the past. A sweet sugary cinnamon past! These are made from scratch using the original Jumer’s recipe and they are so delicious! This was a fun time and we chatted about the old days of Jumer’s and Peoria and Sherry and Olivia told me how people go crazy when these rolls go on sale. And if you keep scrolling you can find out when you can call and order these wonderful and tasty cinnamon rolls for the upcoming holiday season! I swear I couldn’t stop eating these and I really want to thank Sherry and Olivia for making this happen! This is a really big honor to be able to be the first person to sample...well, really I scarfed down about the whole bowl of these cinnamon rolls! And since they let me be the first to bite into these rolls from the past, I wanted to be the first to donate to the St. Jude Cinnamon Roll fund, so I donated twenty dollars and there’s the three of us holding the first donation! After the cinnamon roll feast in the Black Bear Lounge, we went to the lobby and continued our talk about Peoria, Jumer’s and Courtyard Estates. Mark kept snapping photos and Sherry brought out a vintage Jumer’s brochure which was cool to look at and remember the old days in here. Here’s more photos Mark took of Courtyard Estates as it stands today. As you can see, they’ve maintained the old charm of Jumer’s including vintage chairs and stained glass and the original paintings on the outside of the building remain intact. If you want to find out more about Courtyard Estates, the link to their website and facecrack page are below. But I know the question you probably have now is: “When can we order the St. Jude’s Jumer’s Cinnamon Rolls?" Well, the answer is right below this! You can order the Jumer’s cinnamon rolls for St. Jude starting November 1st through the 15th. You can get them frozen to take and bake for your holiday season and while orders are being taken through November 15th, in past years they’ve sold out very quickly, so if I were you, I’d mark my calendar to place your order on November 1st. The phone number to order the rolls is: 309-674-2400 and orders are taken between 9am to 5pm. The pickup dates are November 20th and 21st. And please note that you have to wait until November 1st to order, you can’t call and order early! Thanks to Sherry and Olivia for a sweet afternoon in the Black Bear Lounge, the cinnamon rolls were just as delicious as I remember! And thanks to Mark Jones for the wonderful photography, check out more of his photos right here! We’ll see you all tomorrow! Related Posts: This Used To Be...Jumer’s Castle Lodge, Thirty-Thirty Coffee Co.